Where did you get that Ring? Thank You My Carolina Today! Our first promo with Baginc was so successful, they asked us to feature them again as soon as the last one ended. Of course we didn't hesitate a second before saying OKAY! 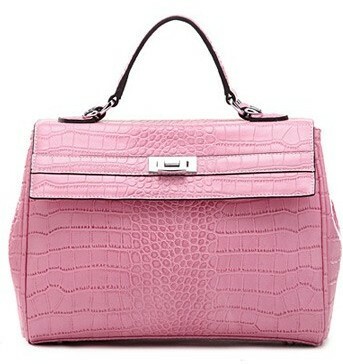 So springy and pretty in pink, this chic leather crocodile-look bag will take you right through summer. It will blend beautifully with the colors of the season including this year's hottest color, Turquoise, and will make black, brown, navy or white pop. It has a detachable shoulder strap, two inner slip pockets and two inner zippered compartments. Its classic style is timeless. Monaco is also available in Blue, Camel, or Gray Leather or Purple Leather Croc and at $82, they won't last long. Grab one today and checkout the entire line at baginc.com. Baginc operates remotely from Paris, France, with a warehouse in Hong Kong. Baginc offers FREE worldwide shipping on purchases of $99 or more. Stay up-to-date on new arrivals, current trends and celebrity styles by connecting with them on Facebook and following on Twitter. Visit baginc.com and let us know which bag, other than the Monaco, is on your wish list. Tweet about this contest, sample tweet ~ #Win a chic handbag from @Bagincbags and @ChicLuxuries on http://ChicLuxuries.com RV: $82 #Contest #Giveaway Open WORLDWIDE! Contest ends 11:59 PM ET May 18, 2012. For Complete Rules and additional Gifting Events, please visit our Chic Giveaways page. I Love Melrose Glam Anarchy Studded Calfskin Leather Bag Black <3 But then again i love them all lol They are all gorgeous and give a great fashion statement . Liked Baginc on FB as Judith B.
I love the Jayne Satchel Leather in Black because its classy and stunning . #Win a chic handbag from @Bagincbags and @ChicLuxuries on http://ChicLuxuries.com RV: $82 #Contest #Giveaway Open WORLDWIDE! H World Cowhide Leather Studded Bag Hot Pink is awesome!!!!! Calfskin shoulder leather bag. Love it. I like the The Essential Jane Bag Canvas Purple. Such a pretty lilac color for spring! My favorite pick is the London Leather Tote in Tan. I "like" Baginc on Facebook. I "like" Chic Luxuries on Facebook. I like the Grace Snakeskin bag in blue. I love Eleonora Leather Keepall Bag Khaki! I already Fan of Baginc on Facebook! Alexa Studded Calfskin Leather is gorgeous! i like baginc on facebook! My fav is the "Alexa Studded Calfskin Leather Bag in Camel!!" Seriously, this is beautiful!! Besides the Monaco, my favorite bag is The Biker Cowhide Leather Bag in Burgundy. They have a lot of lovely bags to choose from! Thanks so much for the chance to win. Hi, I liked Baginc on Facebook! I Like Baginc on Facebook as Jeannette Naylor Laframboise. I Follow @Bagincbags on Twitter as @JeannetteNL. I Like Chic Luxuries on Facebook as Jeannette Naylor Laframboise. I am now following @bagincbags on Twitter. I Follow @ChicLuxuries on Twitter as @JeannetteNL. I "liked" Chic Luxuries on Facebook. #Win a Fabulous chic handbag from @bagincbags& @ChicLuxuries on ChicLuxuries.com RV: $82 #Contest #Giveaway Open WORLDWIDE! Besides the Monaco bag, I'm liking the Melrose Glam Samurai Studded Calfskin Leather Tote Black. I love the Jane Bag in leather brown! I like the Supermodel Pick Quilted Leather Flap Bag Black. I Like Baginc on Facebook. I follow @Bagincbags on Twitter. I think my favorite is the Nickie Cafleskin Leather Tote in brown. I like Bag Inc. on Facebook. I LOVE The Look For Less Leather Bag in Black! I could fit a lot in there! My wife would love a pink handbg. I like the Cool & Trendy Leather Bag (and Most Coveted Bag for Years in black, as a close second). Always nice to have a bag that I can put a laptop in for school and work! The Biker Cowhide Leather Bag Purple.... boy is this nice or what??? Sure like it. I love the The Essential Jane Bag Leather Turquoise. Thank you for the chance to win! I like the Lana leather shoulder bag in black/orange. I also like the Alexa Studded Calfskin Leather Bag Chocolate. Thanks. I like Baginc on FB. Name-Heidi Whitman. Thanks. I don't have a Twitter accoutn but I hope I can still enter. I Visited baginc.com and, besides the Monaco, my fav bag is the Dita Calfskin Leather Shoulder Bag Blue, gorgeous!! My fav bag is the Dita Calfskin Leather Shoulder Bag Blue!!!!!!!! I love the Bella Calfskin Leather Shoulder Bag in Camel. Thanks for the giveaway!